Column forms are starting to protrude from the ground at 1326 South Michigan. 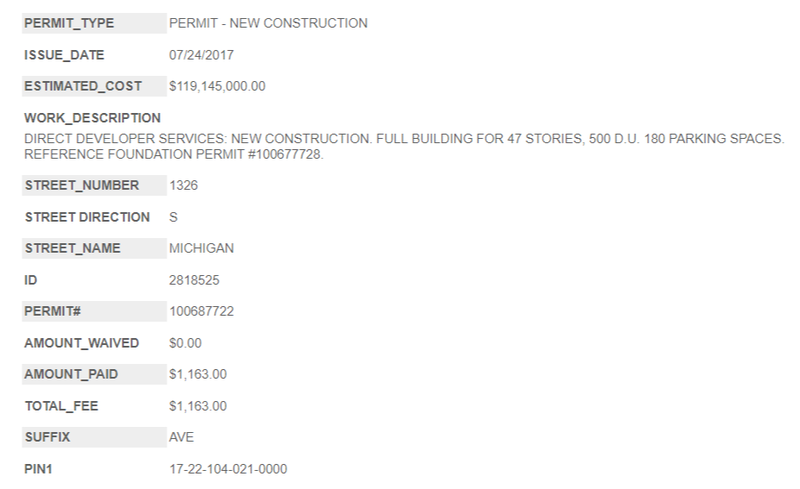 The full-build permit, issued July 24, 2017. On Monday of this week, 1326 South Michigan received its full-build permit from the city of Chicago. That means crews from Walsh Construction can keep right on working at a frantic pace and start sending this one vertical. To the tune of 46 stories, to be exact. And within those 46 stories? 500 apartments, developed in tandem by Murphy Development Group with CIM Group, and designed by SCB. Twitter user @ChrisAHorney, who works as MDG and last month clued us in to the tower crane being erected on this site, tells us today we can expect a name change for 1326 South Michigan in the coming weeks. And we always look forward to that kind of news. As for that permit, The Big Green W didn’t seem to take much time celebrating its arrival; 1326 South Michigan is frantic with activity today, as you’ll see in the time-lapse video and photos below. Columns are starting to protrude from the ground at 1326 South Michigan.